Chances are you have taken a spill down the entry RV steps. 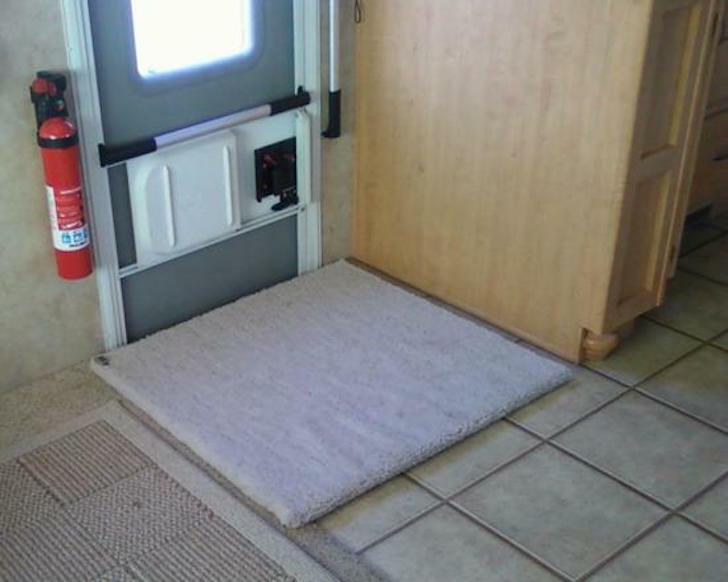 This RV mod means to prevent that from happening and giving you more usable space. Clever idea. If you haven’t had a child, spouse, friend or pet take a spill down the entry RV steps then you are quite fortunate. 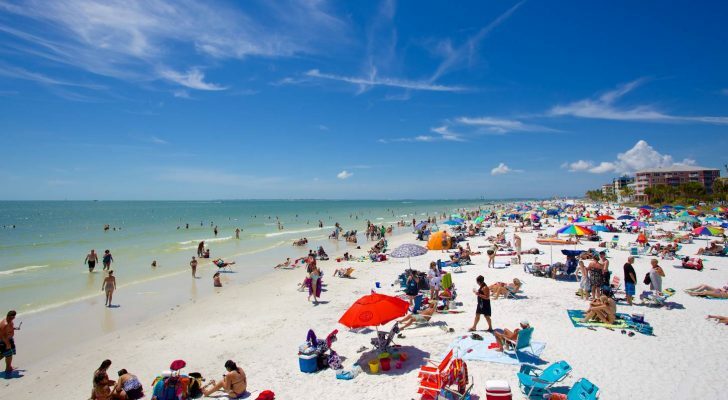 Chances are you have and hopefully no one was hurt and you were able to laugh it off. 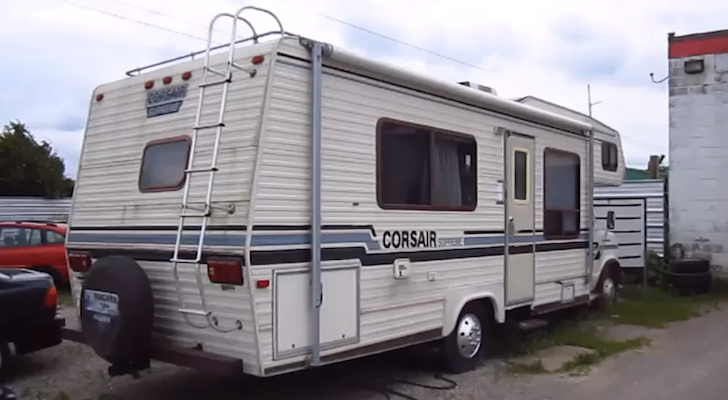 We have had it happen multiple times and always just assumed there wasn’t much we could do about it until coming across this mod to the entry RV steps by “Scarab0088” in the iRV2 Forums. After having the same concerns that many of us do over a few aging on-board companions, he decided to take action. 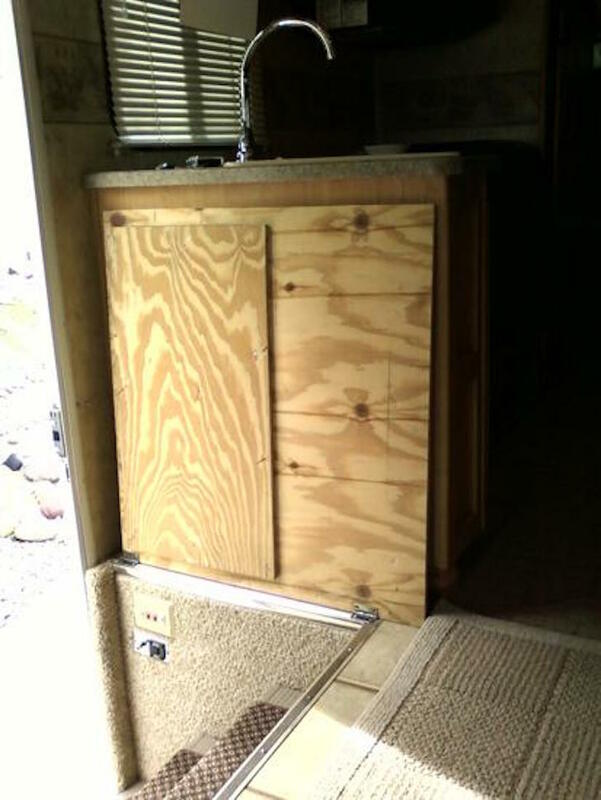 The result was a clever design using a few hinges, some plywood, and a little bit of carpet to create a “trap door” as he calls it over the entry RV steps. The fabrication is quite simple. Have a look at the parts list below. 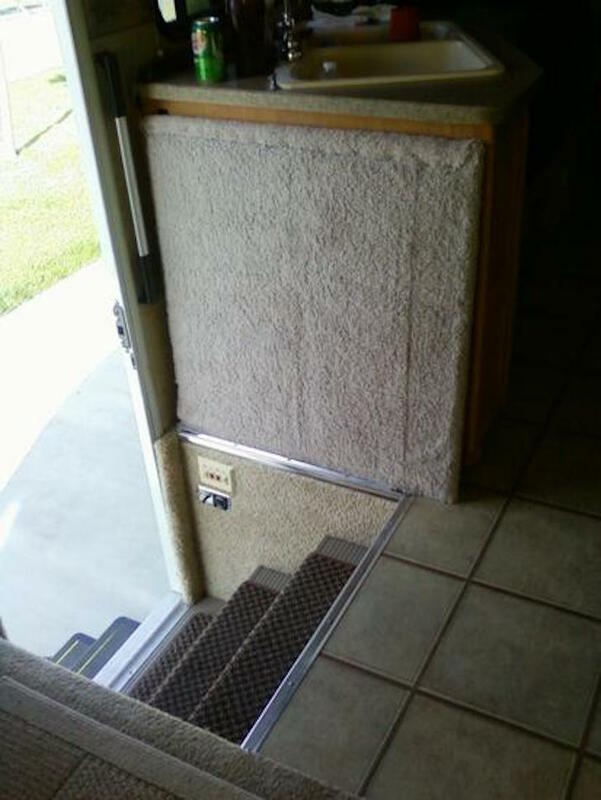 The installation of the entry RV steps mod should be easy for anyone that has worked with plywood before. A few cuts and screws and this thing is ready to go. Cut to fit the plywood sections x2. Screw and glue the 2 pieces together. Remove entry handle if happens to be in the way and replace with Camco handle. 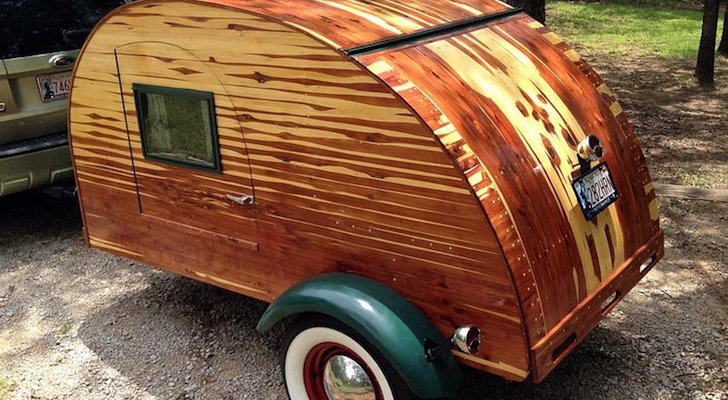 Apply carpet to the finished plywood. 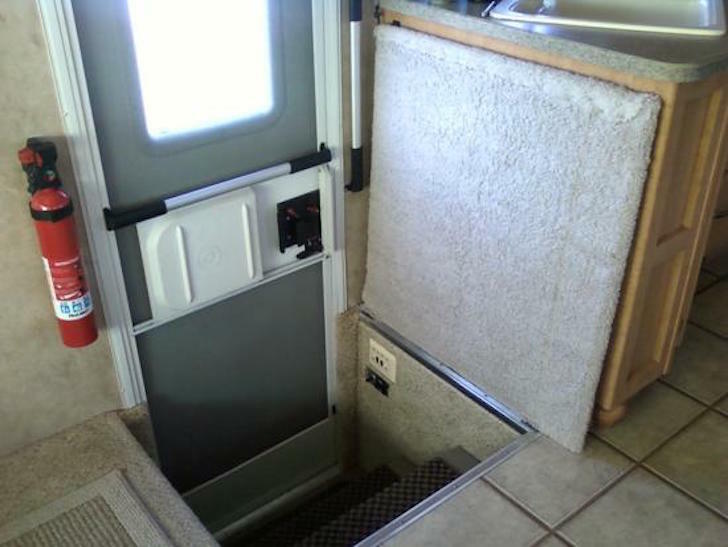 Put the entry RV steps door in place and fasten to RV floor. Install magnetic latch and reinforce cabinet wall if needed. 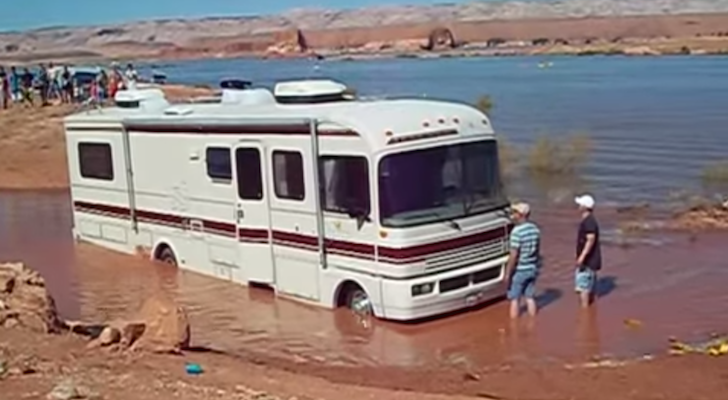 RV mods are something many of us enjoy for various reasons. 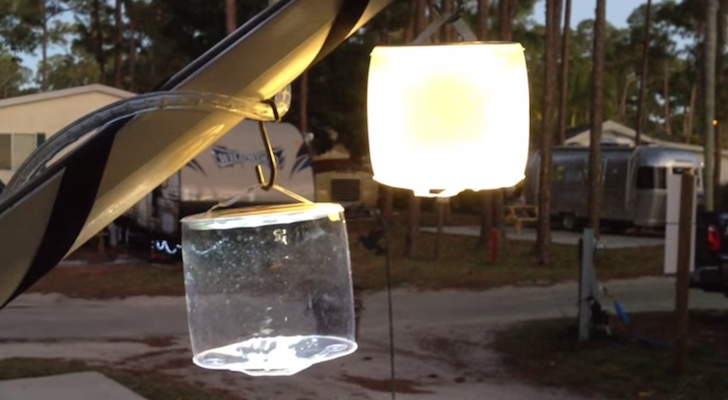 When you come across one that adds safety into the mix its always a good addition to your RV. The entry RV steps mod also adds much needed surface area to the main area. As an addition to this we are considering adding a pull rope (36” long) to the top left corner (when facing the door) with a magnet on the end so we wouldn’t need to bend over when needing use of the entry steps. 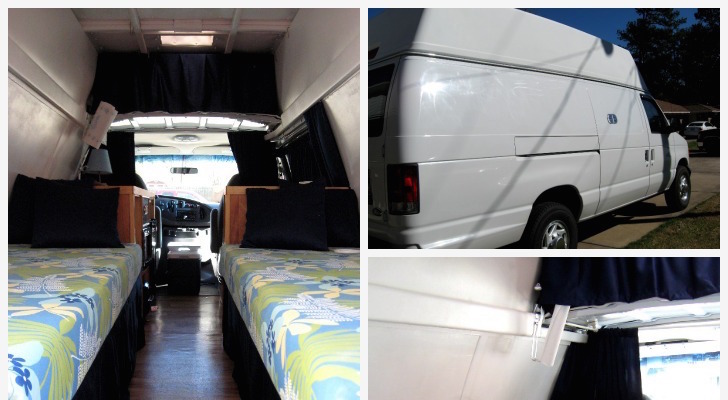 As always if you have comments or have something like this setup in your RV we want to see it! 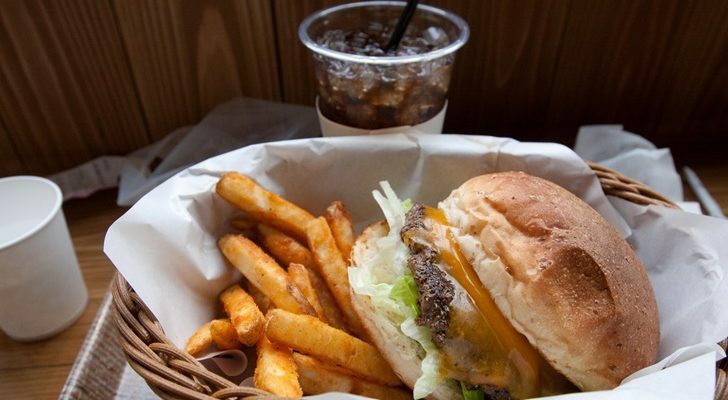 Send us over a message via email or in the comments section below!